Reply 'For Captn Maxwell', discussing how best to take a course of goat whey. Cullen also alludes to directions already given to Sir William Maxwell of Calderwood. 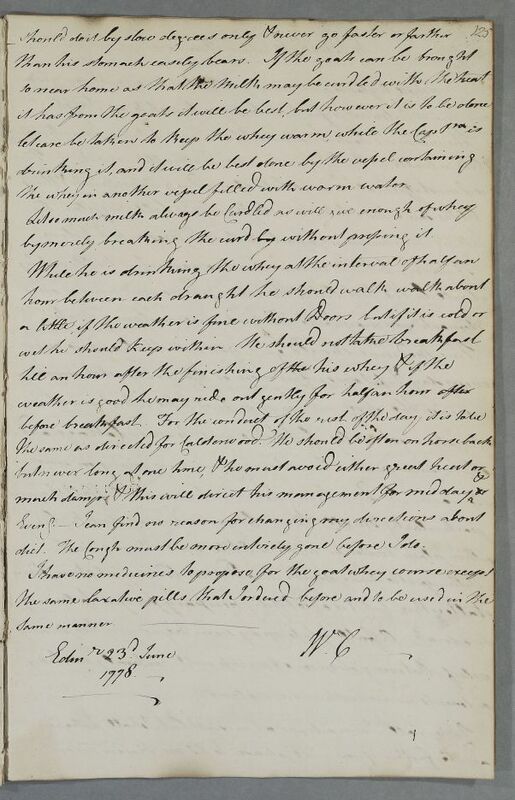 The Captain is presumably going to Arran because both men (presumably related), are found visiting Arran for a repeat goat whey course in 1779. Summary Reply 'For Captn Maxwell', discussing how best to take a course of goat whey. Cullen also alludes to directions already given to Sir William Maxwell of Calderwood. The Captain is presumably going to Arran because both men (presumably related), are found visiting Arran for a repeat goat whey course in 1779. Case of Captain James Maxwell of Faskally who has a chest complaint for which he takes a course of goat whey. 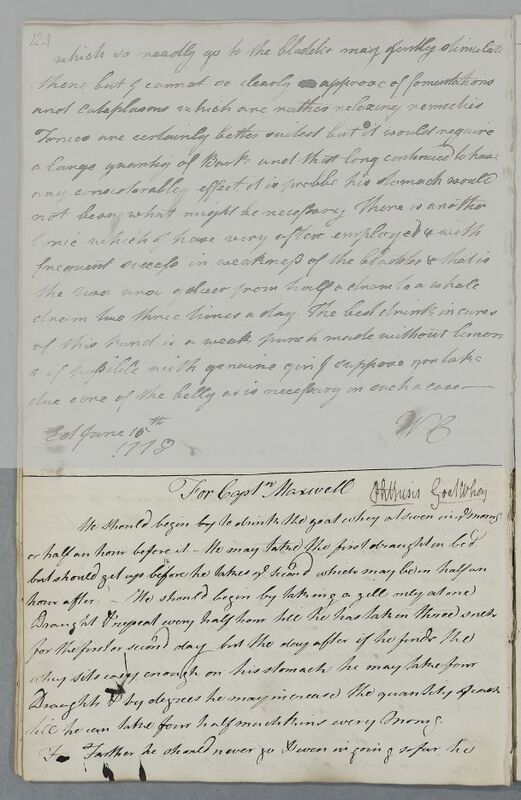 Case of William Maxwell of Calderwood whose condition, probably consumptive, has not improved but who is going once again to Arran to take goat-whey, on which treatment Cullen gives detailed advice. He is to be accompanied by Captain James (See Case 779). till he can take four half mutchkins every Morning. the whey in another vessel filled with warm water. by merely breaking the whey by without pressing it. diet. The Cough must be more entirely gone before I do. till he can take four half mutchkins every Morng.